Like many others in India, even I was unaware that January is Thyroid Awareness Month until recently when I got an opportunity to attend this very informative session on Thyroweight with Dr. Shehla Shaikh and Bollywood Actress Juhi Chawla who busted many myths about thyroid disorder in women and shared great insights on Thyroid imbalance and how to cope up physically and mentally to live life to the fullest . 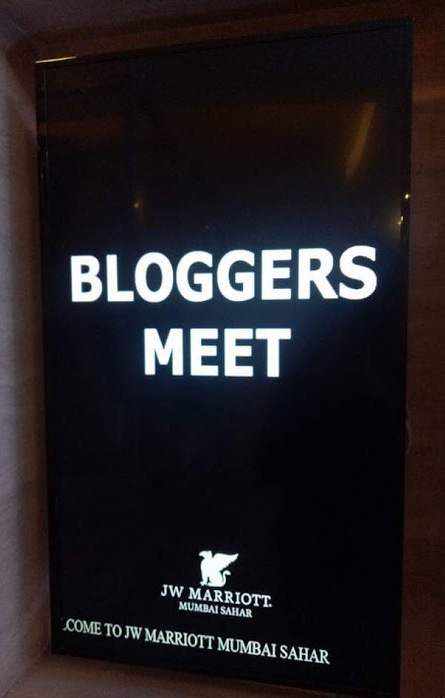 It has been observed that 1 in 10 Indians suffer from thyroid disorder and women are more prone to thyroid disorders. People aged 35 years and above are at higher risk . Now before this number increases, its high time we educate people and be precautions. This event was very informative for everyone to understand Thyroid gland functions, symptoms of thyroid disorder and medications. To start with Thyroid gland is located in the front part of the neck along the wind pipe. Thyroid gland helps to regulate many body functions by constantly releasing a steady amount of hormones into the bloodstream, increasing metabolism and maintaining energy levels in the body. In case a person suffers from Thyroid disorder it can either be 1) Hypothyroidism – less secretion of thyroid hormones.2) Hyperthyroidism – excess secretion of thyroid hormones. Compared to hypothyroidism which is common, hyperthyroidism is not very common. Lets understand why thyroid disorder being so common goes neglected so often? A very common symptom of thyroid disorder is ‘ Thyroweight ’. Thyroweight is the weight gain one experiences along with fatigue, lethargy and tiredness. One tends to ignore the weight gain just as another issue that we can sweep under the carpet and forget about it OR just start a diet and walking plan to try and manage the weight gain. Since all these symptoms are all generic in nature, it often goes unnoticed and attributed to stress and lifestyle changes. It is this weight gain and tiredness –Thyroweight , that should definitely be attended to lest it becomes a fatal disorder. Coming back to Thyroid disorder, if untreated can also lead to heart failure , Memory loss or mental slow down and depression and may become more severe over time. 2) Hyperthyroidism: fatigue or muscle weakness, Mood swings, weight loss, Skin dryness, rapid heartbeat . It is always advisable to diagnose a disorder in time. To diagnose thyroid disorder, it is recommended to undertake a test to diagnose Thyroid disorder; TSH – thyroid-stimulating hormone is a blood test which is the most common test to detect thyroid disorder. If diagnosed with thyroid disorder, one should take the tests every 6 to 8 weeks initially. Once the thyroid hormone level is maintained, the tests could be taken every 4-6 months, post consulting with a doc. Walking is the best exercise says Dr.Shehla, a renowned Endocrinologist associated with hospitals like Saifee, Wockhardt. 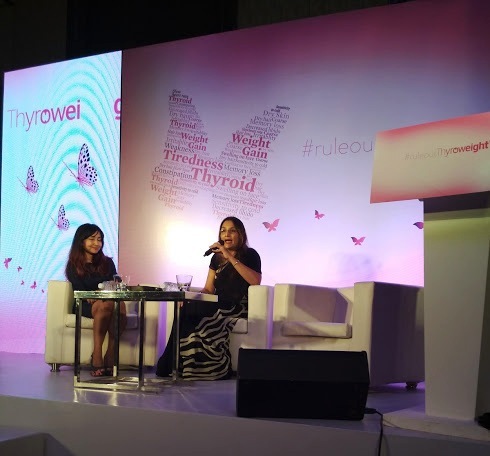 Diva Juhi Chawla shared how important it is to be regular with thyroid medicines. Juhi Chawla cited her own example that even her husband and father-in-law had been diagnosed with Thyroid disorder but with simple daily medication, they are leading a normal healthy life and have ensured that they #RuleoutThyroweight from their life. 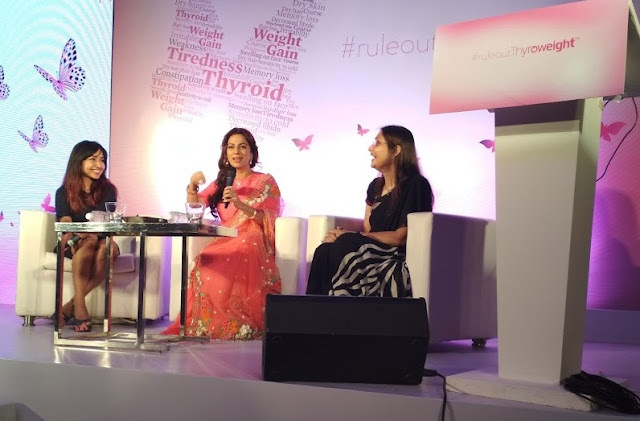 Adding that Health is total wealth, Juhi said that we should get our thyroid tested, and incase diagnosed with thyroid disorder, just one pill a day can help one to lead normal lives. Diva Juhi Chawla supported the cause saying - Life can be as normal and superb with a small pill. It’s great to see celebs speak for a real issue. 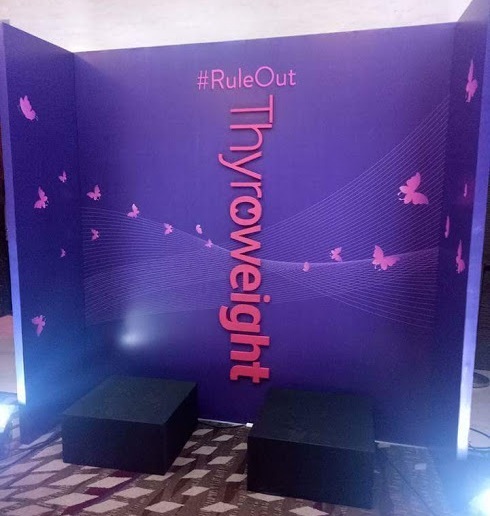 Thyroid symptoms are subtle yet damaging, but timely diagnosis can help #RuleOutThyroweight from your life. If you want more in-depth information on Thyroid Disorders, visit thyroidindia/Thyroweight.com and rule out Thyroweight.